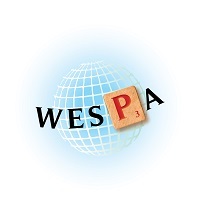 If you would like to stage an internationally rated tournament, first check the Criteria for WESPA Rated Tournaments to determine if it is likely to be eligible. If you believe it to be exempt from application, forward details direct to the tournament & ratings committee chair for inclusion on the calendar. Applications for rating a specific event which is not exempt are to be forwarded to your region representative or the Tournament and Rating Committee chair using this form. Consult the "Apply for WESPA Rating" Tab for more information. Once approval is obtained, check that your tournament appears on the International Calendar. If it does not appear within one week, contact the webmaster. WESPA can provide promotional assistance where tournaments are submitted with enough lead time to the event taking place. Dedicated webpages greatly assist with this. In addition, it is advisable, though not a requirement, to make a list of registered players available when known. For players who have competed internationally before, their names in the file must match those on the current ratings file to avoid them being treated as new players. If you are using the TSH software developed by John Chew, you should follow the Instructions for TSH Users in order to ensure the correct process, including name checking, is followed when exporting to the requisite *.tou file.